Before this year really takes off and I completely change how I organize and decorate everything, I want to show you how my home has looked most of the past year. Organizing is a passion of mine, and decorating runs a very close second. I love my spaces to be both functional and beautiful. (In a maybe childish way) I have favorite colors. 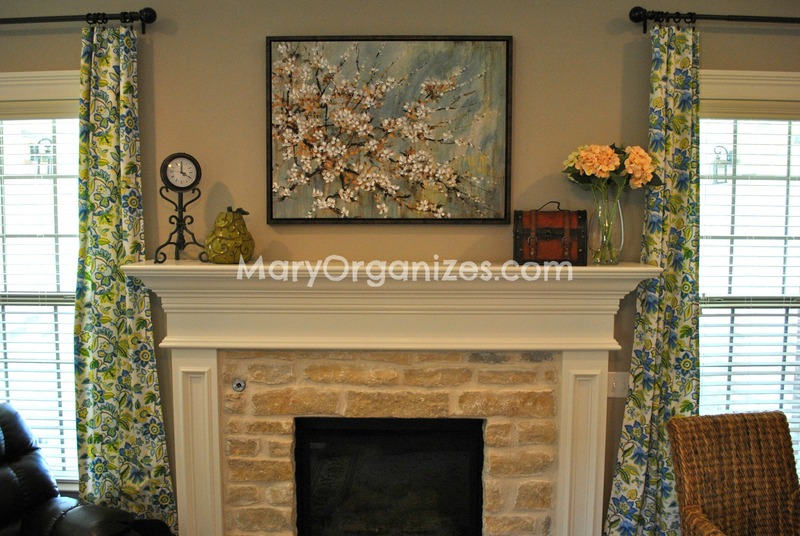 You’ll notice blues, greens, and yellows running rampant throughout my home. I can’t help myself. Those colors sing to me. My kitchen is my favorite place in our home. 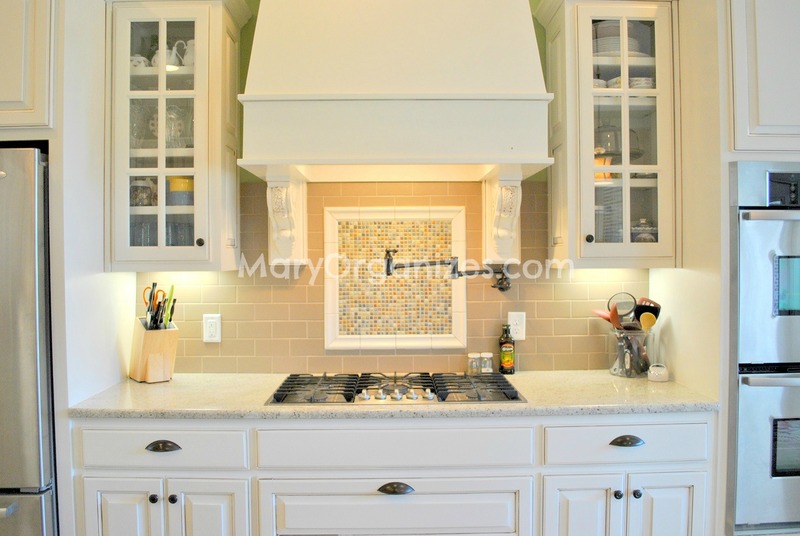 Our home was a custom build, so I got to pick out details like the subway tile backsplash, and fun lighting. Since my stovetop faced the wall, I wanted to give myself something interesting to look at while I cooked. I used small colorful tiles surrounded by framing tiles to create a tile mosaic that is not just a backsplash, but a work of art. A butcher block island simplifies all the chopping for dinner prep. 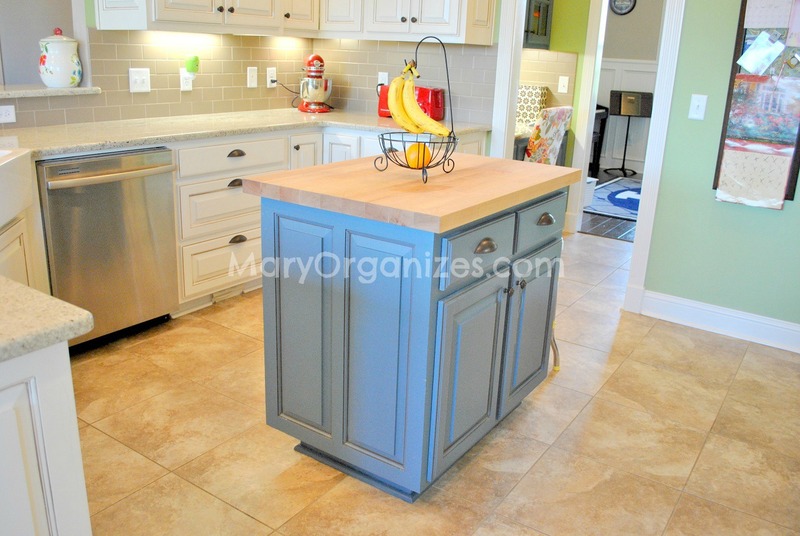 Over time, the oils, juices, and knife marks have aged the butcher block and now it has a warm shabby chic feel. 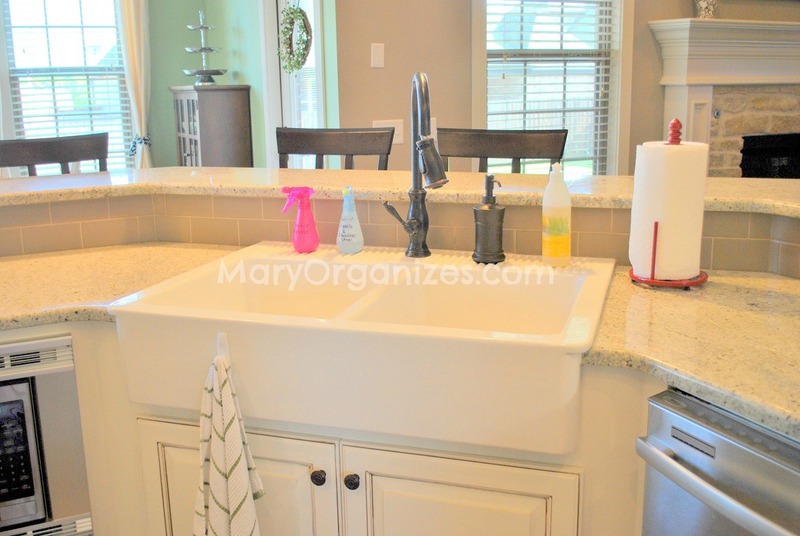 My Farmhouse sink – A dream come true! Above my cabinets, I tried to make little groupings or vignettes instead of continuous decor across all the tops of my cabinets. I enjoyed mixing colors and textures. 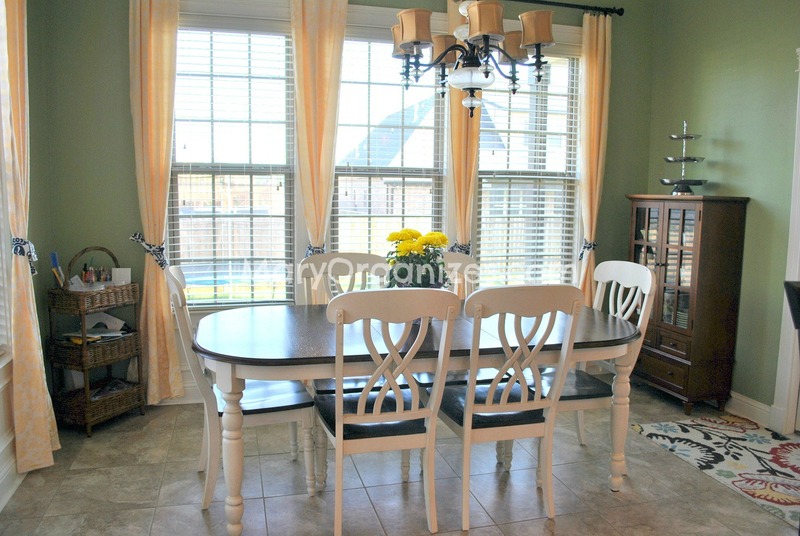 Our table is a frequent gathering place for my family. The tiered baskets to the left of the table hold all of my kids art stuff, and I hold our Sunday dishes in the cabinet to the right. I like that the cabinet is short enough that my kids can open the doors and set the table on Sundays. This is the mantel in my living room. I feel like I’m constantly staring at it, thinking of little things I want to change or add. The only time I completely change it all out is Christmas time. Throughout the rest of the year it is some variation of this. This is my favorite corner, because of its abundance of my favorite colors. This is my husband’s office, but lets face it, the kids probably spend just as much time in here as he does. This room sees a lot of action! I tried to make the room fit the rest of the house, but give it a masculine flair for my husband’s sake. The curtains are a navy burlap. This is the ceiling in the office. 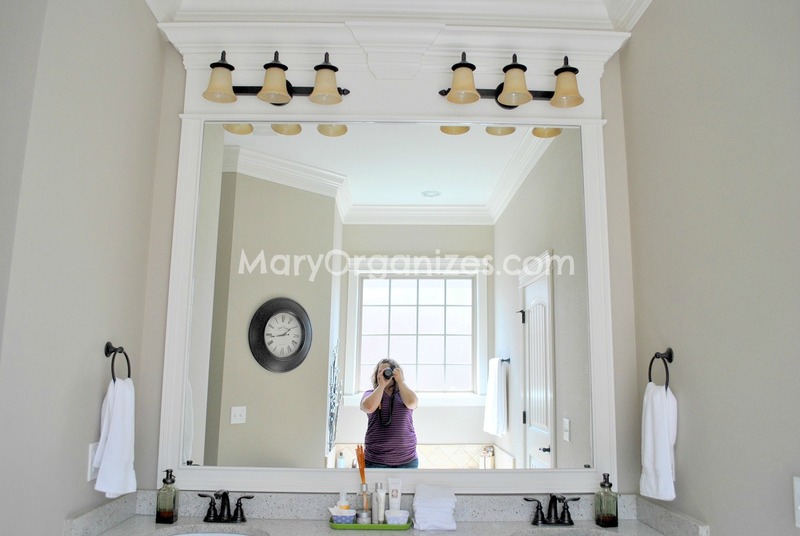 This same ceiling style is also in the master bedroom. This is my master bedroom. I usually try to keep this space clear of anything that has to do with the kids (the parents deserve one space, right? ), but right now we are still recovering from the ice damage in this room. I found the his and hers coordinating lamp shades on clearance at Pottery Barn. I love a good find! This is my master bathroom. I love white towels in the master bathroom. I want my bathroom to feel like a spa! I use a new white washcloth every night, and after I dry my face, I wipe up my sink and counter, so it never gets dirty. The mirror is framed out, which is pretty fun. This is my soaking/Jacuzzi tub. What a difference a good bath can make! I toned down all of the colors in this room, which is unusual for me because I love using lots of happy colors. I just felt like the time I spent getting ready for my day or for bed, needed to be a bit more soothing. 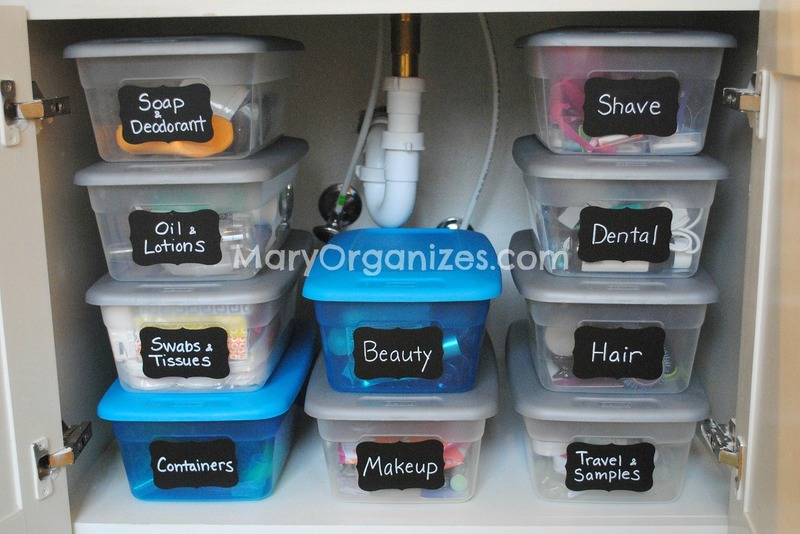 And well, I’m an organizer, so I think I should show you at least one of my organized spaces, right? This is the storage under my bathroom sink. Excited for all the updates coming this year!! 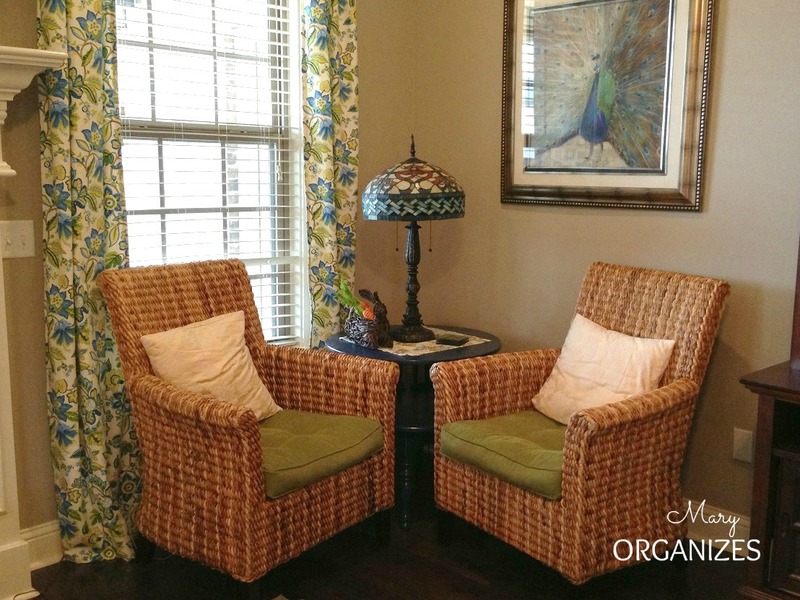 I love the corner seating area. It looks like a great place to relax with a cup of coffee and good book. Mary, I love your blog. I signed up just recently and receive your posts via email. I have lots of questions about your house tour but will start by saying that I like the vignettes above your cabinets, I think the tile at your stovetop area is precious, and I appreciate your taking the time to create a house tour. How do you treat your butcher block? 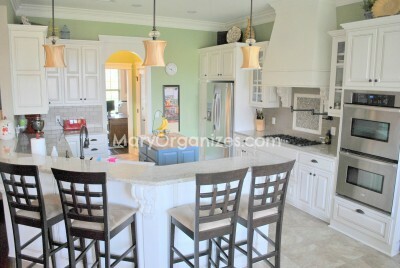 We have 3 large butcher block spaces in our kitchen and I love to hear how others manage theirs? Thanks! 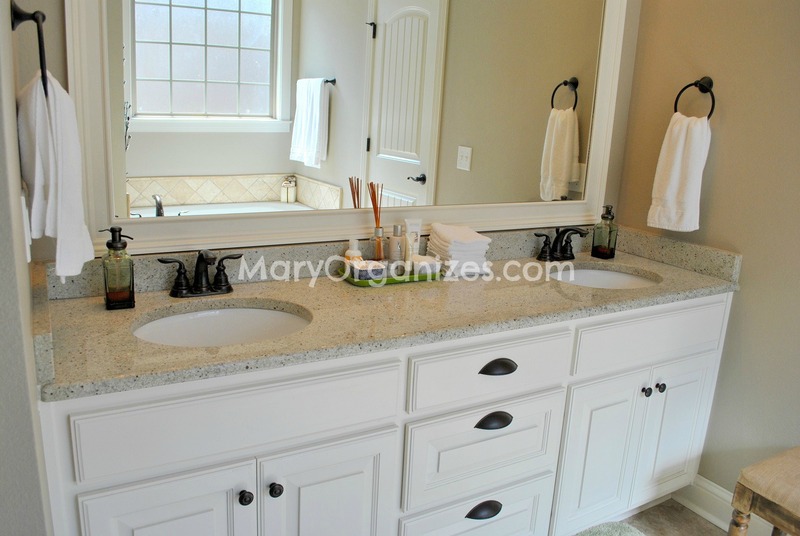 I absolutely LOVE that farmhouse sink! I may have to try and talk the hubby into one of those! 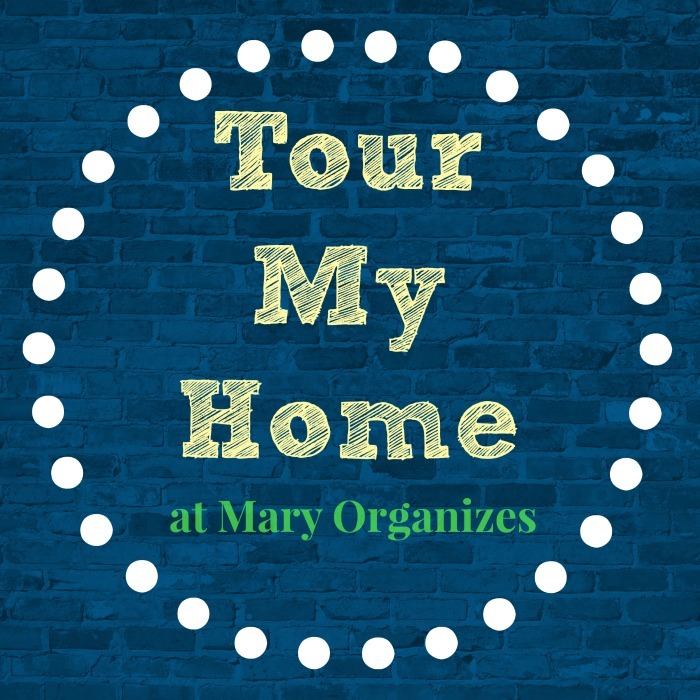 Your home is beautiful, Mary! Thanks, Christina!! I LOVE IT!